Respectable speeds and helpful tools make this VPN a solid choice. Budapest-based Buffered VPN isn’t an exceptional product. It ‘s not particularly speedy, its Windows app is serviceable but nothing special, prices are a little high, and its server count and country locations aren’t that impressive. Still, in my time with it, I found the VPN to be pretty good. Buffered has a very simple one-panel interface with a list of every country it supports. To connect to a country, you just scroll down the list to your desired country, click on the entry, and the app starts connecting you. It would be nice if you could search for a desired country, but currently you have to use your mouse or touchpad. 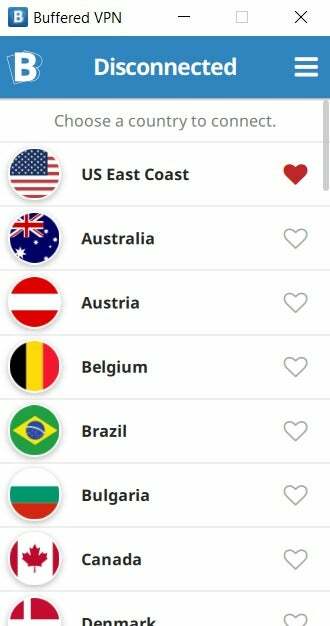 Each country listing has a heart icon on the far right allowing you to make it a favorite. Favorite countries then show up at the top of the country list. Once you’ve connected to your destination of choice, the VPN interface switches to information about your connection including current upload and download speeds, total bandwidth up and down, and your current IP address. This connected panel also has a Tools drop-down menu with a bandwidth test tool that allows you to see the speed of your current connection. 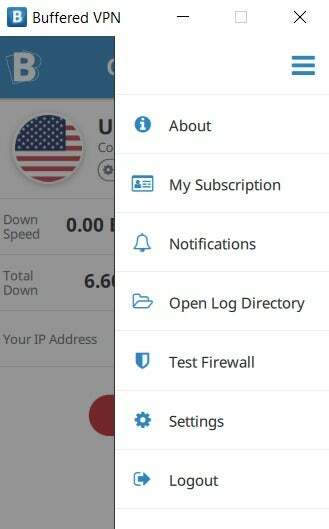 Going back to the primary country list interface, the upper-right corner features a “hamburger” menu icon where you can access the app’s settings, a firewall test, and other features. The firewall test is a useful tool if you’re having connection problems—it will tell you if any of the VPN ports that Buffered wants to use are blocked on the network you’re using. You can then choose to an open port to use for the VPN. The Settings section of Buffered doesn’t offer any extra features, though there are a few nice touches. You can, for example, choose how the “X” button in the upper-right corner operates. By default, clicking it closes the application. Alternatively, clicking the “X” can minimize the application to the system tray, removing it from the taskbar. The latter behavior is how some VPNs operate by default, but I really like the notion of offering both options and allowing the user to decide. That said, Buffered is also set to start-up by default at Windows boot. That’s not great, but it’s not unusual either. Buffered says its service can be used to circumvent geo-blocking but doesn’t mention Netflix. No surprise then that Buffered is not one of the VPNs doing battle with Netflix’s VPN ban. Buffered offers apps for Windows, macOS, as well as Open VPN configuration files for Android and iOS—that means no mobile apps. Buffered used to offer an application for Linux, but currently only offers a Linux app as a legacy download. Buffered VPN’s built-in bandwidth test. Buffered VPN’s speeds were pretty good but nothing exciting. Overall, Buffered’s average speed across five different connections was 27 percent of the base speed. That’s a fair rating, with impressive speeds in both the UK and Germany. 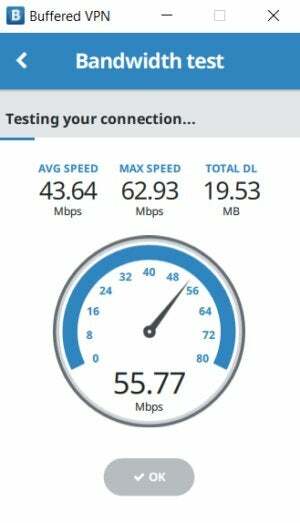 The U.S. speed was less than 14Mbps, which is fine for most uses. As I’ve said many times before, your experience may vary. To sign up for an account, Buffered only asks for your email address, but it doesn’t stop there. Once you’re up and running with Buffered, the VPN also requires you to supply your name and address on your account profile on Buffered.com. The company says it needs this for billing. Nevertheless, Buffered is probably not a great choice for people seeking higher levels of anonymity. Buffered takes payment in credit card and PayPal only, which is another strike against serious anonymity since there are no cash or Bitcoin options. The company told me, however, they hope to accept Bitcoin payments soon as it’s an oft-requested feature. As for the company itself, Buffered has a webpage dedicated to the company’s various office addresses around the world. The main one is in Hungary, but there is also an office in Gibraltar and the company’s payment arm is run out of the United Kingdom. Those last two offices are likely either virtual offices or third-party business services. Still, it’s nice to have all this information in an easily accessible place. Buffered doesn’t specifically list its management on the website, but it wasn’t hard to find out that Buffered’s CEO and co-founder is Gergely Kalman. Buffered VPN doesn't offer any standout features, but it nevertheless provides dependable VPN service with a straightforward interface.